Imagine if you could attend a masterclass on how to craft a speech that employs the most powerful aspects of storytelling? That's essentially what we get to do when we study the Academy Award-winning filmmaker Steven Spielberg's commencement speech at Harvard University in 2016. The director of Jaws, Jurassic Park, Schindler's List, the Indiana Jones film series, Bridge of Spies, among numerous other famous films, casts his audience—soon-to-be Harvard graduates—as the heroes in their own epic story, while he serves as their guide on the great adventure called Life. And it's Spielberg's story structure that we're going to focus on in this article to give us insight into how we, as entrepreneurs, can craft compelling speeches that connect with our audiences and move them to action. And gain a proven template or structure for writing highly effective speeches for our businesses. If you have time and want to watch the speech first, go ahead. Otherwise, let's examine the speech transcript in light of the eight components outlined above to see what we can learn. Objective: Here Spielberg connects immediately with his audience by sharing his own college experience—but with a twist: it took him 37 years to graduate. Thank you, thank you, President Faust, and Paul Choi, thank you so much. But eventually, I returned for one big reason. Most people go to college for an education, and some go for their parents, but I went for my kids. I’m the father of seven, and I kept insisting on the importance of going to college, but I hadn’t walked the walk. So, in my fifties, I re-enrolled at Cal State—Long Beach, and I earned my degree. Takeaway: Build a bridge to your audience so that you can connect with them and bring them along with you on the "journey." Come up with a twist that creates surprise or tension to grab the audience's attention from the get-go. Objective: This is where Spielberg sets up his talk. He's essentially saying, "You, like the great heroes of epic stories, are about to embark as the hero of your own life story." Well I left college because I knew exactly what I wanted to do, and some of you know, too—but some of you don’t. Or maybe you thought you knew but are now questioning that choice. Maybe you’re sitting there trying to figure out how to tell your parents that you want to be a doctor and not a comedy writer. Takeaway: Make the setup of your talk both suspenseful and relatable. Stoke curiosity for "What's going to happen next?" and use examples that you know your audience can relate to. Objective: Every hero has a backstory that provides insight into what experiences have shaped that hero's personality and what's driving them to leave relative safety to embark on a mission fraught with risk and uncertainty. In this speech, the backstory is about the tension between the voices—and opinions—of those around us and the quiet inner voice that's nudging us to go in a different direction. And at first, the internal voice I needed to listen to was hardly audible, and it was hardly noticeable—kind of like me in high school. But then I started paying more attention, and my intuition kicked in. Takeaway: Without a good backstory, your audience won't understand the context as to why your speech, your message, your story matters. Objective: Spielberg shows how the hero's mission sets up the epic battle that looms ahead, using an example from his own story to show how his audience can discover their unique mission. And up until the 1980s, my movies were mostly, I guess what you could call ‘escapist.’ And I don’t dismiss any of these movies—not even 1941. Not even that one. And many of these early films reflected the values that I cared deeply about, and I still do. But I was in a celluloid bubble, because I’d cut my education short, my worldview was limited to what I could dream up in my head, not what the world could teach me. Takeaway: In the story you're telling, what does the hero (or your audience) want to accomplish? What is their mission? When you clearly define the hero's mission—perhaps it's to launch a new product, turn around a struggling business, keep the team together—you set the stage for the battle that will keep your audience with you, wanting to know how the hero will overcome the obstacles and win. Objective: Every hero needs a guide to help them fulfill their mission. For example, Luke Skywalker's guides were Obi-Wan Kenobi, Yoda, and "the force." In this section of the speech, Spielberg says that the audience has four types of guides at their disposal who can help them fulfill their mission. And the way you create a better future is by studying the past. Jurassic Park writer Michael Crichton, who graduated from both this college and this medical school, liked to quote a favorite professor of his who said that if you didn’t know history, you didn’t know anything. You were a leaf that didn’t know it was part of a tree. So history majors: Good choice, you’re in great shape...Not in the job market, but culturally. The rest of us have to make a little effort. Social media that we’re inundated and swarmed with is about the here and now. But I’ve been fighting and fighting inside my own family to get all my kids to look behind them, to look at what already has happened. Because to understand who they are is to understand who were, and who their grandparents were, and then, what this country was like when they emigrated here. We are a nation of immigrants—at least for now. But look, if your family’s not always available, there’s backup. Near the end of It’s a Wonderful Life—you remember that movie, It’s a Wonderful Life? Clarence the Angel inscribes a book with this: “No man is a failure who has friends.” And I hope you hang on to the friendships you’ve made here at Harvard. And among your friends, I hope you find someone you want to share your life with. I imagine some of you in this yard may be a tad cynical, but I want to be unapologetically sentimental. I spoke about the importance of intuition and how there’s no greater voice to follow. That is, until you meet the love of your life. And this is what happened when I met and married Kate, and that became the greatest character-defining moment of my life. Takeaway: Remember, every great hero has flaws and needs help from a guide to help them overcome those shortcomings to accomplish their mission. In your speech, introduce the guide—a product, service, idea—that will equip your hero (your customer) for success on their journey. Objective: Spielberg puts it succinctly: "A hero needs a villain to vanquish." In this speech, that villain is Hate. Now, I don’t have to tell a crowd of Red Sox fans that we are wired for tribalism. But beyond rooting for the home team, tribalism has a much darker side. Instinctively and maybe even genetically, we divide the world into ‘us’ and ‘them.’ So the burning question must be: How do all of us together find the ‘we?’ How do we do that? There’s still so much work to be done, and sometimes I feel the work hasn’t even begun. And it’s not just anti-Semitism that’s surging—Islamophobia’s on the rise, too. Because there’s no difference between anyone who is discriminated against, whether it’s the Muslims, or the Jews, or minorities on the border states, or the LGBT community—it is all big one hate. Takeaway: No villain, no story. Sounds basic, yet far too many entrepreneurs are too afraid to tell business stories that include any tension or negativity out of fear of offending someone. Yet, stories without a villain—an obstacle or challenge—are inherently offensive ... because they're boring and waste the audience's valuable time. Objective: Spielberg tells the audience that the key to vanquishing the villain—Hate—is with empathy. He then provides examples of what winning the battle looks like, with action steps that the audience can take today. And to me, and, I think, to all of you, the only answer to more hate is more humanity. We gotta repair—we have to replace fear with curiosity. ‘Us’ and ‘them’— we’ll find the ‘we’ by connecting with each other. And by believing that we’re members of the same tribe. And by feeling empathy for every soul—even Yalies. Takeaway: You'll notice in this last paragraph how Spielberg directs the audience to participate with him—"Everyone here, please find someone's eyes to look into"—as a powerful illustration of how we can build our capacity for empathy. Look for ways to involve your audience with your story, so that they gain a greater appreciation for your message. Objective: Spielberg recaps the speech, tying it all together with a "story" bow. And finally, I wish you all a true, Hollywood-style happy ending. I hope you outrun the T. Rex, catch the criminal and for your parents’ sake, maybe every now and then, just like E.T. : Go home. Thank you. Takeaway: Create a send-off that highlights the most important point you want your audience to take away—and make it memorable. How do we pull this altogether to help guide the development of our next speech? 1. Connection: How can we make a personal connection in a way that grabs our audience's attention? 2. Setup: What exactly is the "journey" we're going to take our audience on over the next 20 minutes (or however long the speech)? 3. Backstory: What is the context as to why our topic or story matters to the audience? 4. Mission: What exactly does the "hero" of our talk want to accomplish? The hero could be the audience members themselves or a specific person we're talking about in our "story." 5. Guide: Who or what is the "guide" to help the hero through the challenges and discouragements that lie ahead. 6. Villain: Who or what is standing in the way of the hero fulfilling the mission? 7. Conflict: What happens when the hero confronts the villain? What are the stakes if the hero prevails? Or fails? 8. Lesson: What's the moral of the story? What key lesson do we want our audience to takeaway from our speech? As Lisa Chron writes in her book "Wired for Story," "We think in story. It's hardwired in our brain. It's how we make strategic sense of the otherwise overwhelming world around us." 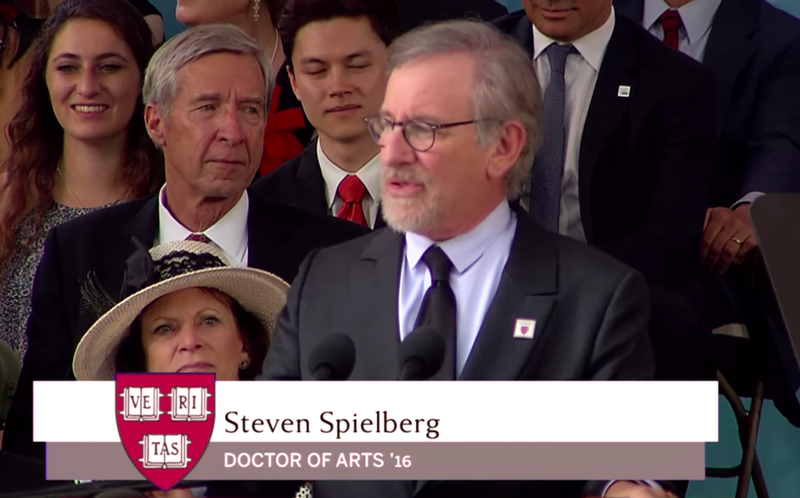 And Spielberg's Harvard commencement speech gives us with a powerful framework for how we can more effectively connect our speeches to the "story wiring" in the minds (and hearts) of our audiences.